Ian Tyson, an iconic western singer, is a 100th Calgary Stampede parade Marshal. The Stampede Parade is much more than 350.000 people converge on the streets of down town Calgary. One of the rituals during stampede is to inculcate equality and make everyone think they’re the same as everyone else from the mayor to the average Joe. So we dress up as cowboys, which is to hide social class. We are on the streets of Calgary full of crowds of people. 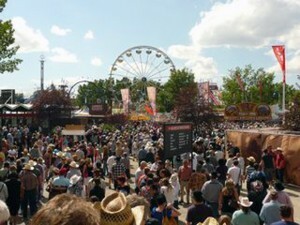 “Gleb, what is the meaning of Stampede for you?” I asked my grandson who happened to be here at the Stampede time. “Grandma, better not to mention Stampede, you remember how I spent 400 dollars just for the rides?’, he answered. “Oh, well”, sighed I, nodding in reply. As for me, Stampede means Chinook arch in the skies.